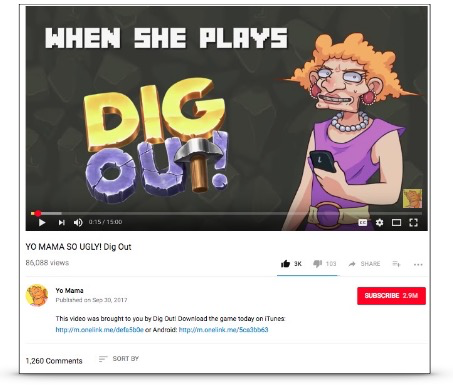 After over a year since the mobile game’s release, Zimad, the game developer, wanted to expand their reach to a new audience by sponsoring video content on Youtube that is evergreen and shareable. Yo Mama is a popular Youtube channel that publishes animated videos about “Yo Mama” jokes. The channel has about 3 million subscribers who are highly engaged with its content. Because the videos on this channel are produced from scratch, the Creators were able to work closely with the Sponsor to integrate the customized content into the delivered video. After Yo Mama published the sponsored video on their channel, Zimad Dig Out also shared the video on their own social platforms.